As the first half of 2016 fast approaches, Toyota’s Camry remains the sales leader in the USA in the crowded mid-size sedan marketplace. What does it take for this unassuming four-door to beat such heavy hitters as Honda’s Accord, Nissan’s Altima, Hyundai’s Sonata, Ford’s Fusion and VW’s Passat? 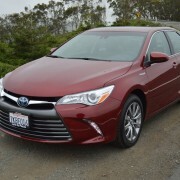 If our week in the Hybrid version of the Camry is any indication, it takes excellent fuel mileage combined with reputable dependability to persuade Americans to buy more Camrys than any other mid-size product. 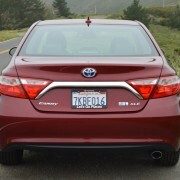 Of all the models in the Camry line, from the 173hp entry-level 2.5 liter LE to the 268hp 3.5 liter XLE, only one garners top honors in the fuel efficiency sweepstakes. 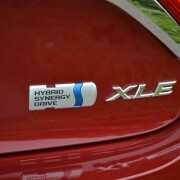 That would be the Hybrid XLE we drove. 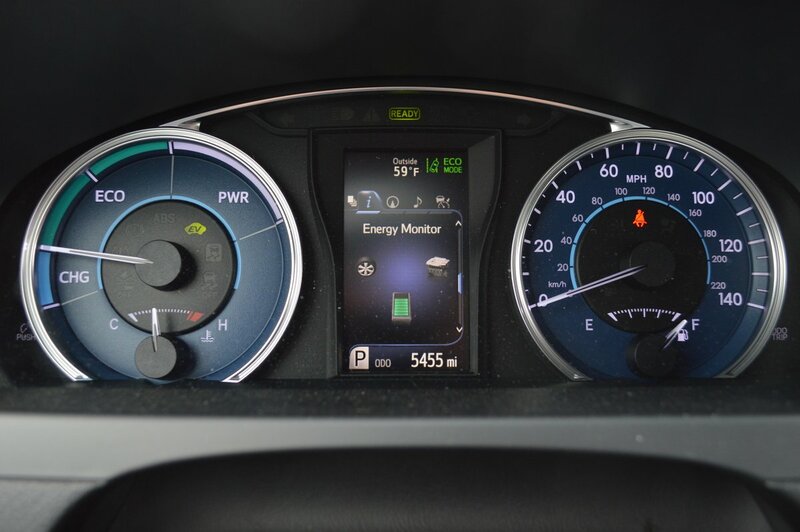 In a solid week of testing, including numerous short hops and long distance cruises, the fuel level never once dipped below the 3/4 full mark because the Hybrid scores 38 MPG on the highway and an even better 40 MPG around town. This is truly amazing for a fully appointed four door that weighs more than a ton and a half. 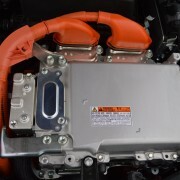 This Hybrid rates 9 out of 10 on the EPA’s “Fuel Economy and Greenhouse Gas Rating” and it does so without the inconvenience of a plug-in receptacle. You can hold your green head high with this vehicle and never once suffer the range inhibition so common to owners of fully electric vehicles. 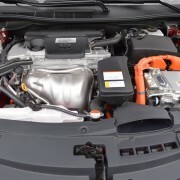 The acceleration of the Hybrid is surprisingly strong with good torque immediately on tap as the CVT transmission shuffles belts to maximize output from a standstill. The Hybrid uses a 2.5 liter inline four cylinder petrol engine good for 178hp. 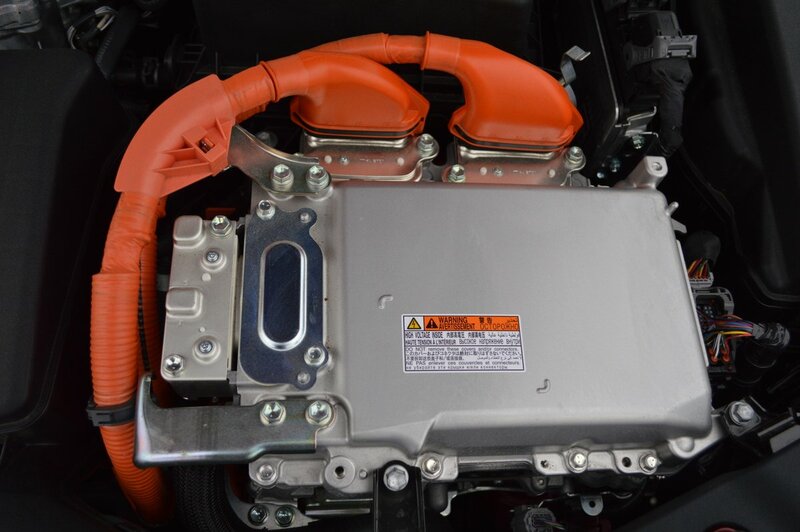 This unit combines with an electric motor to boost total output to 200hp. 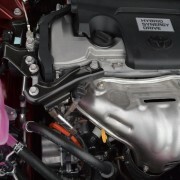 The additive value of the electric motor thus adds 22hp to the 2.5 liter gas-only Camry. In practice, that 22 extra hp transforms the sedan’s performance from boring to rewarding. There was never an occasion when the Hybrid was wonting for pop. 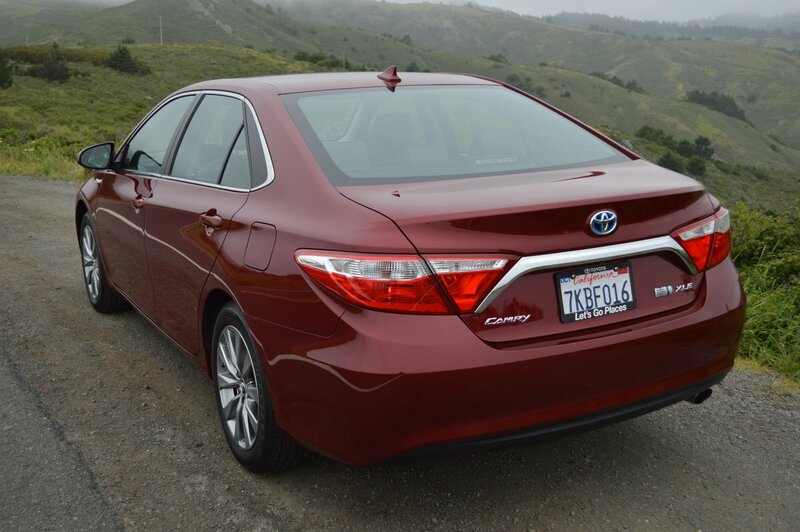 This year Toyota offers a sports handling package for the Camry called “XSE.” From all reports, it doesn’t do much for your driving enjoyment but actively diminishes ride comfort. 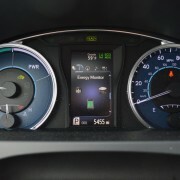 Our Hybrid was equipped instead with the XLE trim level, which adds the following niceties: Entune infotainment with 7 inch touchscreen, navigation, auto on/off LED headlights, moonroof, dual-zone climate control, Qi wireless phone charging, heated front seats and leather upholstery. 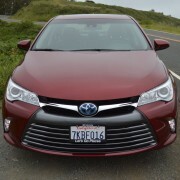 In addition, Toyota fitted our test sedan with a Homelink transceiver ($345), and a premium JBL audio system ($1,330). 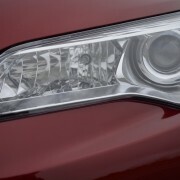 Also upping the price by $750 was an “Advanced Technology Package” which adds Dynamic Radar Cruise Control, Lane Departure Alert, and a Pre-Collision System that tightens the seat belts in advance of contact. 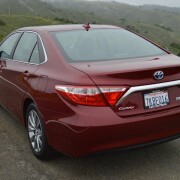 The Camry will never qualify as a sports sedan, no matter how much Toyota stiffens the suspension with the XSE option. 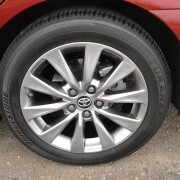 But you could definitely improve its handling by replacing its mediocre Bridgestone Turanza EL400 tires (215/55R17) with the 18 inch rims and higher performance rubber which Toyota makes available on the XSE model. Also available at your dealer are the splendid looking 10 spoke, 18 inch rims which Toyota bolted to the limited production (only 12,000 examples) 2016 Camry Special Edition (SE). In any event, the Camry is a workhorse, not a racehorse. 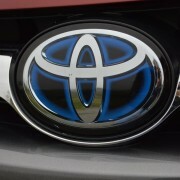 But its styling update, administered in 2015, still looks fresh enough to entice more buyers into Toyota showrooms than any other manufacturer. One of the explanations for this continuing phenomenon is reliability. 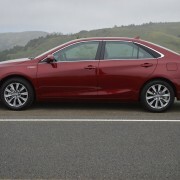 Consumer Reports slaps a “Recommended” check mark on the Camry model range in large measure because this sedan scores a “Much better than average” rating in the all important “New Car Prediction” category. 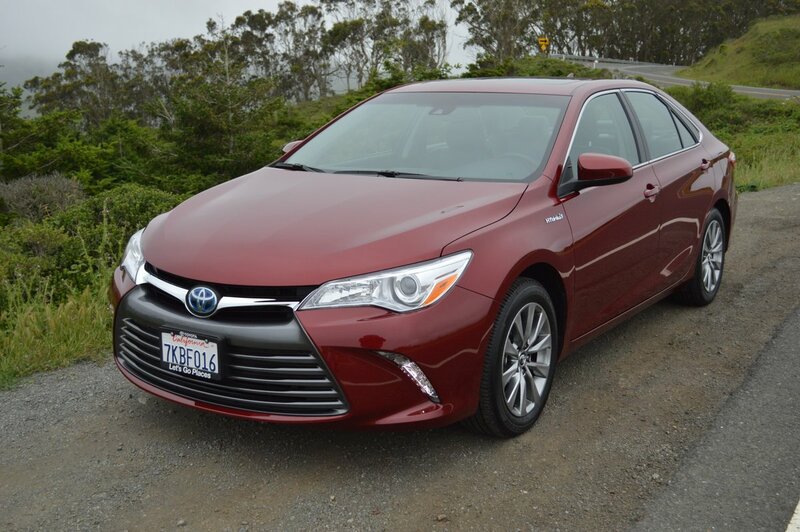 If you’re on blood thinning medication, you’ll be relieved to know that the Camry Hybrid will never threaten to raise your blood pressure. While it won’t unduly excite you, it will also never unexpectedly disappoint you. The odds of getting stuck due to a mechanical malfunction are so remote that you can let your AAA membership lapse without so much as a pang of anxiety. 2010 Hyundai Genesis Coupe – First Ride. Not Drive, Just Ride.